It would be appropriate to call this "skinny tomato soup" because it is low in calories and fat but that always brings up images of tasteless, watered-down broths as part of some hare-brained fad diet. Well, not here. This recipe for healthy tomato basil soup has all the flavor of its higher-fat cousins without the guilt. 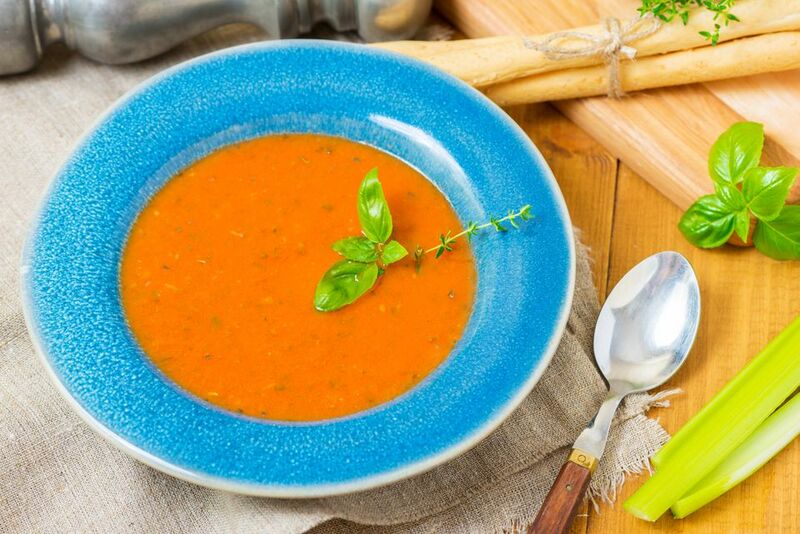 We might think eating traditional tomato soup is a no-brainer healthy choice but, surprisingly, there can be hidden calories and fat. Of course, you are still getting all of the nutritional benefits of tomatoes, such as high concentrations of the antioxidants lycopene, beta-carotene, vitamin A and vitamin C. But you also might be treating your body to copious amounts of butter, sugar, and cream, which we all know means added calories and grams of fat. This quick-and-easy, low-fat, low-calorie tomato and basil soup eliminates the fats and focuses on the stars of the show. Best of all, start to finish, it can be on the table in 25 minutes. It is a perfect soup for all seasons. In the summer, you can substitute fresh chopped tomatoes for all or some of the canned, which will add a little but not a lot of time to your prep, and extra broth to make up for the lost liquid. And this is a great way to use the abundance of fresh fragrant basil in the markets or your own garden. In the winter, this soup is warm and comforting. And because you have control over how finely the ingredients are puréed, you can leave it a little chunky to make it a filling first course or a meal when paired with a low-fat grilled cheese sandwich on whole-wheat bread fried in a nonstick skillet. Add onions, celery, and garlic and gently sauté until softened, about 5 minutes. Watch carefully to make sure the garlic doesn't brown. Add basil, thyme, tomatoes, and broth of choice. Bring to a boil. Reduce heat and simmer for 10 minutes. Remove from heat and allow to cool a little. Use an immersion blender to purée the soup. Alternatively, you can purée in batches in a food processor or blender. Purée it lightly if you like your soup chunky. Otherwise, purée it fully for a velvety consistency. Serve hot or on a hot summer day, chill the soup and serve it cold with a celery stalk stirrer. This soup is naturally gluten-free and, for a vegetarian/vegan version, substitute vegetable broth for the chicken broth called for.